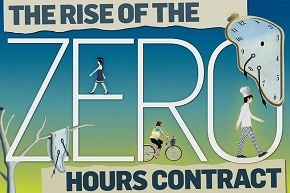 Zero-Hour contracts are they right for your Business? - TI Accountancy Ltd.
Around 2.3% of the UK work force use zero-hour contracts and this number is rising. Employer’s usually employ people under a zero-hour contract to secure flexible employees when staff levels vary throughout the year. It is useful to use zero-hour contracts where work demands are irregular or there is not a constant demand for staff. Every cloud has a silver lining, and here are some of the benefits and pitfalls to look out for when using zero-hour contracts. It provides you, as the employer, with the option to have a flexible work force. There are no obligations to provide workers with hours. You only pay the workers for the hours worked. The worker does not have to accept the work if they don’t want to, which could leave you in a bit of a pickle if you need someone to work urgently. There could be a conflict of interest as workers are now entitled to have more than one zero-hour contract with other employers. Workers are also entitled to certain employment rights that may put a strain on the business. As mentioned above all workers have certain employment rights such as holiday pay, ALL workers accrue holidays for the hours worked, even when they are under a zero-hour contract. Within the first-year workers must accrue the holidays before they can be taken. If there is a break within the employment, it is the employer’s duty to pay any accrued holidays that the worker hasn’t taken before they leave. However, if the employment is continuous, after the first year the worker can take the holidays without accruing them first. They are also entitled to the National Minimum Wage, National Living Wage and pay for work-related travel in the same way as regular workers. You may notice I have been using the term “worker” and not “employee”, this is because most employers employ workers. However, if a worker’s employment status changes to employee, there are other rights they have, such as statutory notice rights. Developments that contribute to such a change could include subjecting the employee to disciplinary action if they don’t accept all the hours they are offered. Zero hours status also must be shown in the contract as well as in practice. If this is disputed, an employment tribunal may decide for themselves what contractual relationship exists between employer and worker and any associated employment rights, including enhancements such as accruing the right to take maternity leave or pay and the right to ask to request flexible working. These are all things to think about when deciding if zero-hour contracts are the way to go for your business.